This brand new 12.9 metre day boat from Whitehaven debuted just last month and evokes “the elegance and ease of a bygone era,” according to the yard. Key features include generous aft deck seating, a spacious saloon and lounge for hosting social soirees and accommodation for a maximum of six guests. 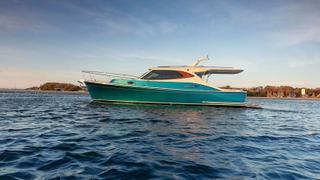 Offering the option of either single or twin propulsion packages, the Whitehaven Harbour Classic 40 is available with a sporty short roof or a longer roof for a fully covered cockpit. This new performance day boat from Sunseeker sees the yard “return to its performance roots” and “draw on the company’s racing heritage,” the yard said. 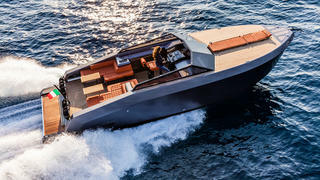 The 11.85 metre boat has been designed in collaboration with Fabio Buzzi Design and has a top speed of 62 knots thanks to twin Mercury R400 outboard engines. Described as “the ultimate superyacht chase boat”, the Hawk 38 is available in a number of paint finishes and upholstery meaning that two boats are unlikely to ever be the same. Originally developed for a private client hunting a fast dayboat he couldn’t find in the wider market, this 16 metre dayboat from Alia Yachts features naval architecture, exterior and interior design developed in collaboration with Dixon Yacht Design. Key features include an on deck main saloon and galley, both of which are shaded by a large fibreglass hardtop. Other features include a double cabin with an ensuite, a shower and second galley with sink and fridge. 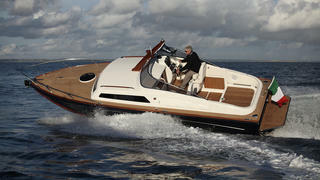 Power comes from twin Volvo IPS 650 units for a top speed of over 35 knots. 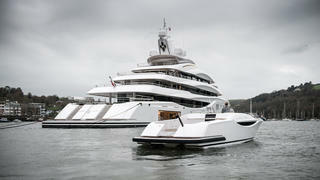 Fitted with bigger engine alternatives, the boat would be able to exceed 40 knots. The 7.5 metre custom Sense tender was designed specifically to accompany its mother ship Stella di Mare, the CBI Navi 39.67 metre superyacht delivered earlier this year. Both Stella di Mare and her Sense tender were designed by Hydro Tec. Designed with three generations in mind, the Sense tender had to be stable and comfortable for the 75-year-old owner while being speedy enough to cater for water sports, such as water skiing. Accessibility to and from the tender was key. It features an opening bow access directly to the shore and an aft embarkation built to the same height as the swimming platform of Stella di Mare. Nauta Design’s custom designed sailing superyacht chase boat, the 14.62 metre Nauta Tender 48, features exterior and interior design by Nauta Design and naval architecture by Francesco Rogantin. The Nauta 48 is intended for a variety of roles, such as “scouting potential anchorages, bringing guests to shore, provisioning and staying in ports too shallow for the mother yacht.” The tender can also be used for “occasionally short, autonomous cruises” in its own right. 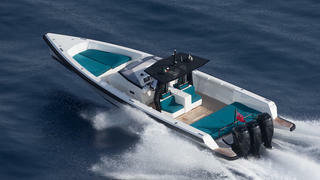 With an eyewatering top speed of 73.8 knots, Technohull’s Omega 45 is the tender of choice for those in a hurry. 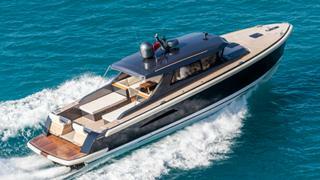 Measuring 13.8 metres, the Greek shipyard’s flagship features wrap around shockproof seats and includes a cockpit kitted out with an electronic console supported by touchscreen smart central control. 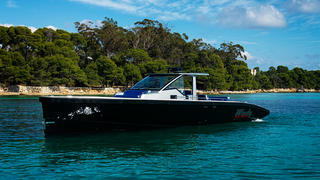 The Omega 45 can be equipped with either inboard or outboard engines with a top propulsion option of four 44hp engines. For those looking for a fast thrill, the R35 may well fit the brief. 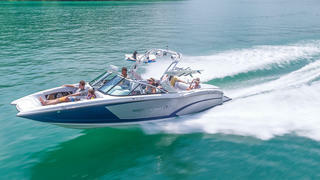 With twin all aluminium V8 petrol engines, the R35 is the fastest ever Princess tender with a top speed of 50 knots. Described by Princess as “the most technologically advanced and significant sports yacht ever”, the R35 showcases a number of revolutionary performance capabilities including an Active Foil System developed with BAR technologies which optimises stability and manoeuvrability in all sea conditions. It is set to launch in September this year. 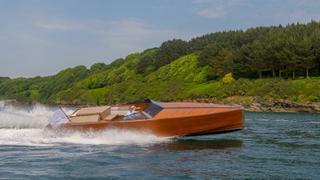 Built in Falmouth, this slick and stylish tender is hot off the press after being unveiled in May. Based on a concept by British design studio RWD, the Titian tender features interiors by Cullum Bespoke who brought experience from the world of luxury car customisation. With a beam of 2.8 metres, the tender can accommodate up to six guests for a day on the water who can relax beneath the shade of the electric bimini. Meanwhile the crew are treated to high-end systems including an Empirbus control system and electric anchor launcher and joystick controls. With plenty of experience providing exceptional performance in wet conditions, Pirelli is a natural design partner for Italian yard Tecnorib. 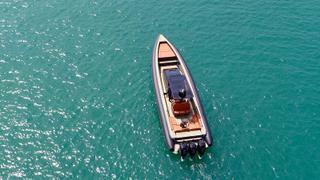 The 1900 is the largest maxi-RIB yet to spring from this collaboration, offering a superyacht chase boat to be proud of. With an overall weight of 16 tonnes, only the world’s largest superyachts could expect to carry one on board, but this 2,000hp speed machine would certainly make a fine addition to any yacht owner’s fleet. Turkish yard Mazu only made its debut in 2016, but it has made a big impression in the months and years since, with its aggressive styling by Halit Yukay. Adding to its credentials as a superyacht chaseboat is a completely customisable interior and deck layout, as well as a removable bimini. Offering the ultimate in head-turning style, the Foiler from UAE yard Enata Marine is at the forefront of a new wave of foiling superyacht tenders. Smooth cruising at speeds of up to 40 knots are offered via twin 320hp BMW hybrid engines and a retractable foiling system that lifts the hull up to 1.5 metres above the surface of the water. Built to CE Category B standards, the Foiler is suitable for extended coastal cruises with a maximum range of 260 nautical miles at 20 knots. Guests can enjoy the thrill of rising above the waves from a pair of bowrider bucket seats, and the transparent prow makes the experience even more spectacular. Currently under construction and due to launch in summer 2018, the Silverfin carries forward Buehler Turbocraft's threefold priorities of style, security and innovation. The touchscreen glass bridge and semi-planing hull take care of the latter, while the walkaround sidedecks ensure that practicality remains at the heart of this design. As for style, the super-sleek Silverfin strikes a fine balance between a traditional lobster boat and a modern expedition vessel. Based in Tampa, Carbon Craft aims to offer the most safe and comfortable superyacht tenders on the water by using lightweight carbon fibre construction and a closed cell foam collar for superior spray deflection. The largest model in the range, the CC180, can whisk up to ten guests ashore at speeds in excess of 40 knots, thanks to a punchy 295hp diesel jet set-up. 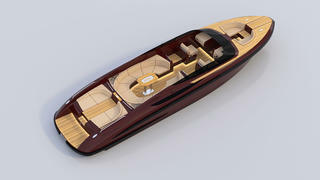 Visitors to this year’s Fort Lauderdale International Boat Show will be able to experience this for themselves, as Carbon Craft will be one of the show’s official VIP tender partners. At 19.83 metres LOA, the Aeroboat S6 is larger than most superyacht tenders, indeed only the world’s largest superyachts would be able to carry one on board. However, as a classy chase boat, she is a truly tempting proposition. Developed as part of a collaboration between British design studio Claydon Reeves and Rolls-Royce, the Aeroboat boasts a unique transforming transom system called Aerostairs that can lower into the water or rise up to pontoon level. 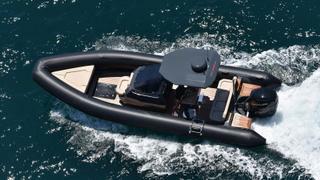 Designed in collaboration with naval architecture firm Vripack, the latest model from XTenders features a lightweight carbon-fibre superstructure, making it easy to carry as a superyacht tender. The first hull has already been delivered to the owner of the 74 metre Lürssen superyacht Global, with an aft helm position and an open foredeck seating area. A forward helm position will be made available on future hulls (as pictured above). 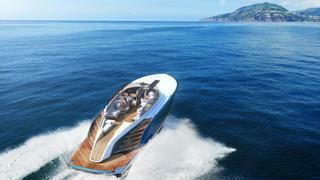 Key features include a transom shower, so it can be used as a watersports vessel, as well as a luxury limousine. Superyacht captain Jonathan Edgar drew on many years' of experience working on yachts such as Ocean Emerald and Ocean Pearl to create JP RIBs. The Custom 800 is a fine example of the range’s blend of high quality and practicality, as all of the wiring, servicing and fuel management systems are easily accessible. Hand-made in New Zealand, these luxury RIBs are completely customisable, with owners able to adjust the exact finish to their heart’s content. 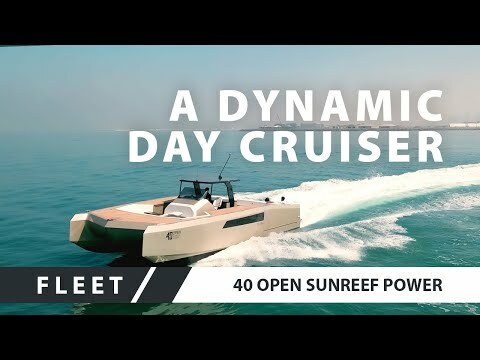 One of the most hotly anticipated new tender launches of 2017, the 40 Open is a 12.75 metre composite dayboat from Polish multilhull specialist Sunreef Yachts, which is available in both foiling and planing versions. The folding bulwark sections back aft allow for great views while reclining on the wide sunpads, while a choice of outboard engine set-ups kicking out up to 1,600hp provide a blistering top speed of 60 knots. 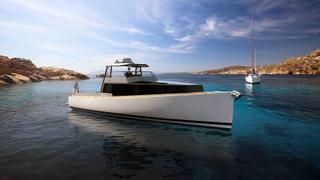 Bespoke yard Argo Navis is currently building three limousine tenders for a returning client. 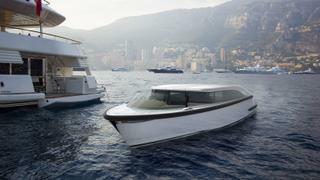 The Limo Tender 34 (pictured above) is a 10.5 metre composite cruiser that has been designed to make the best possible use of the space available in a superyacht tender garage. 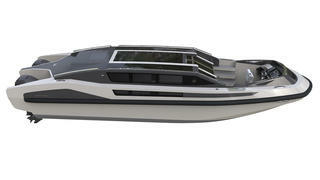 Key features include motorised curtains, a mini bar, air conditioning and 2.1 metre headroom in the main saloon. Twin 300hp Mercury Verado outboard engines promise a nippy top speed of 35 knots — ideal for whisking your guests ashore with the minimum of fuss. 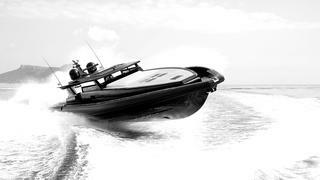 Judged by nomenclature alone, the Gamma Black Shiver is the coolest tender on the water. But that’s just the entrée. With up to 3,700hp available through shallow draught waterjets and a top speed of 50 knots, its one the fastest superyacht tenders too. It looks absolutely sensational — Black Ops RIB meets Stealth Bomber. Inside, twin cabin layout options, a galley and a separate crew area allow the 220 to be used as a self-sufficient explorer away from the mothership for up to 30 guests. A collaboration between esteemed naval architect Hans Jørgen Johnsen and renowned yacht designer Ed Dubois was never going to be anything less than spectacular. Sixteen metres of low profile, high gloss, jet black hull powers along at 45 knots courtesy of triple Volvo Penta IPS600 pod drive engines, with the centre motor pushed forward for ultimate balance. And the fun doesn’t stop when the boat does. The 4.5 metre beam provides acres of space, and the “transformer” hydraulic aft platform with built-in steps cantilevers up and out to create a high dive platform or lowers to give easy access to the sea. 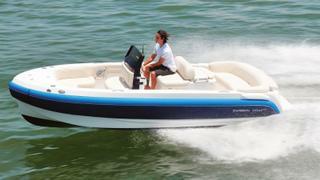 As a Mediterranean or Caribbean chase boat, you won’t find anything better. Wally established the market for very high-end production tenders when it launched the original Wallytender in 2001, aping the hard-edged ‘origami’ technical stance of the magnificent Wallypower yachts. 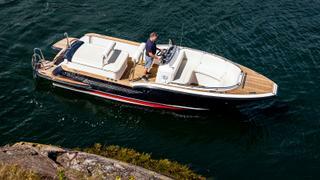 The new Wallytender X takes that philosophy and adds performance — serious performance. 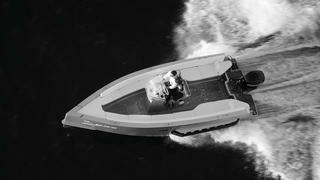 The combined 1,200hp from the top spec triple Mercury 400R Verado race engines across the transom ups the ante to 60 knots. Walkaround decks and two separate sunpad areas — one at either end — mean plenty of space for up to 12 people to enjoy at lower speeds, and there’s a small cabin with toilet and shower facilities. 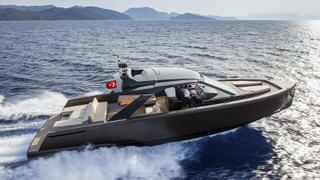 Powered by up to 400hp of outboard, this sharp looking transforming superyacht tender can crack 40 knots, but for once the big news is not the offshore performance; it is what it can do onshore. Lower the twin hydraulically actuated caterpillar tracks, which are powered by an inboard petrol or electric motor, and drive straight up the beach for the ultimate yacht-to-shore transfer. Those caterpillar tracks spread the weight so efficiently that Iguana states that if you can stand on it, you can drive over it. Never has beach access been so easy or so incredibly cool. Far from being merely retro-inspired, the Levi Corsair is, bar a few gentle design tweaks, virtually identical to the 1963 Cowes-Torquay-Cowes race-winning original. 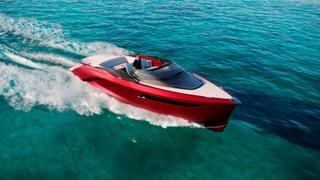 And that includes one of the very best deep V hulls on the water, penned by powerboat design legend Sonny Levi. As a result, it’s a genuine thoroughbred, offering a sensational drive. 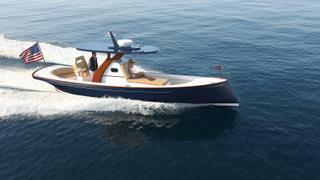 Sensational performance too — where the 1960s race boat had a pair of 150hp petrol engines, this modern incarnation sports a pair of latest generation 265hp MerCruiser/Cummins diesels for a thoroughly 21st century 45 knots. Built at the rate of two a year by artisans in Venice, the quality and detailing inside and out is exquisite. Built over 18 months by Compass Tenders in Hamble, UK, TT Lady Lara is a completely bespoke project created specifically for the 91 metre Lürssen superyacht Lady Lara — a facet most evident in the design. Reymond Langton was responsible for the exterior design of the mothership, and Andrew Langton from the company penned her tender. But it wasn’t just her looks that were dictated by the parent vessel; TT Lady Lara had to be able to pass through a two metre garage opening — hence a total height (with aero screens removed) of just 1.35 metres. Castoldi is regarded as the innovator of the modern waterjet propulsion system, so it’s no surprise that its latest project, the Jet Tender 33 Convertible, is powered by 440hp Yanmar diesel engines linked to Castoldi waterjet units giving close to 50 knots. But to concentrate on the mechanicals would be to miss this unique boat’s party trick. A concealed soft top hinges out of a dedicated storage area to convert this open sports tender into a completely enclosed climate-controlled limousine. For those requiring more compact dimensions, a JT25 is currently in development with a high performance hull capable of fully exploiting the Yanmar 370hp engine linked, of course, to a Castoldi waterjet unit. MasterCraft has been synonymous with tow boat technology for years, and a resurgence in the popularity of waterskiing, wakeboarding and, more recently, wakesurfing means that a tender catering specifically for these pursuits makes a lot of sense. 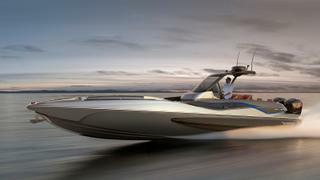 MasterCraft’s dedicated Tenders Division, based in the UK, can offer a range of boats tailored to this role. The chief adaptation is the installation of a powerful Yanmar diesel engine in place of the usual petrol motor, offering increased safety, reliability and parity with the fuel supply of the mothership. Beyond that, custom lift point options ensure compatibility with single or multi-point lifting, spreader bars or keel line lifts.